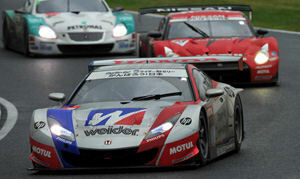 Weider HSV-010 races to its second win of the season! 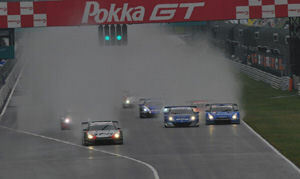 The 40th International Pokka GT Summer Special, Round 5 of the 2011 Autobacs Super GT series, took place on August 21, 2011 at the Suzuka Circuit in Mie Pref. In the GT500 class, the No.1 Weider HSV-010 team (Takashi Kogure/Loic Duval) started from thirrd position on the grid and raced aggressively through changing weather and track conditions to take its second win of the season ahead of the No.46 S Road MOLA GT-R and No.12 Calsonic IMPUL GT-R. The race started at 3:10 p.m. with a rolling start. The rain had nearly stopped at this time but the track condition was wet. The air temperature at the start was 26°C. and the track surface temp. 27°C. With some teams choosing shallow-groove and some choosing deep-groove rain tires, the 500 km battle began after the first lap in this, the longest race of the series. As expected, the pole-sitting No.46 S Road MOLA GT-R driven by Ronnie Quintarelli broke away at the start and began to build a lead. However, as the track continued to dry out, the teams that had chosen shallow-grove (intermediate) rain tires emerged with a decisive performance advantage and began to move up through the field. 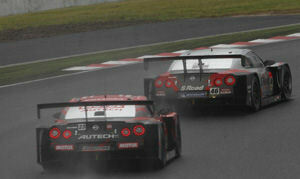 Leading this charge was the No.23 Motul Autech GT-R of Benoit Treluyer. By lap five, the No.23 Nissan GT-R had moved up into 3rd position. It then went on to pass the No.12 Calsonic IMPUL GT-R of Joao Paulo Lima de Oliveira and close in on the No.46 S Road MOLA GT-R. Another car running on shallow-groove rain tires, the No.32 Epson HSV-010 of Ryo Michigami, was showing great speed as it moved up to 5th position, only to crash into the barrier on the last corner of that same lap and drop back in the field again. Continuing its charge, the No.23 Motul Autech GT-R finally moved into the lead on the second turn of the 15th lap and began to pull away from the No.46 S Road MOLA GT-R at a strong pace. The cars that had chosen deep-groove rain tires to start the race began to make early pit stops and change to shallow-groove tires, led by the No.38 ZENT CERUMO SC430 on the 18th lap, while No.23 Nissan GT-R continued to increase its margin of lead over the 2nd-running No.46 S Road MOLA GT-R. The No.23 Motul Autech GT-R finally made its pit stop on the 28th lap, but by that time rain had begun to fall again around the west track and the Nismo team made the decision to send out their second driver, Satoshi Motoyama, with deep-groove tires.